Geisha means art-person. A geisha is a young Japanese girl specially trained in the arts of singing, dancing, conversation, and forms of hospitality. She can be hired by a man to serve as his companion. In Madame Butterfly, Cio-Cio-San is a geisha. The Japanese form of writing is a highly skilled art. It requires the use of a brush to be able to make heavy and light lines. The Japanese borrowed the Chinese system of writing which is made up of thousands of intricate characters that stand for words, not for sounds. Characters are written starting at the top of the page and working down. Shinto, which means the way of the gods, is the oldest surviving religion of Japan. Shintoists worship many deities or gods, which they refer to as kami. They believe kami to be the basic force in nature: mountains, trees, rivers, and even humans, dead or alive. Their belief that gods (kami) can take human form is tied to the history of the origin of Japan and the ancestry of Japan's imperial family and the divinity of the emperor. According to Shinto mythology, the god Izanagi and the goddess Izanami (in Madame Butterfly, Suzuki prays to these gods in the beginning of Act II) gave birth to the Japanese islands, and then Izanami, while washing his nose and his eyes, produced the sun goddess Amaterasu. The grandson of Amaterasu, Ninigi-no-Mikoto, was designated to rule over Japan. It was his great-grandson Jimmu who became the nation's first Emperor. Successive emperors were venerated as direct descendants of the gods and held sacred authority as the symbolic fathers of Japan's national family. 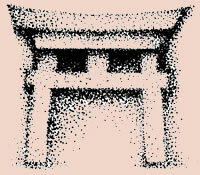 A wooden gate known as a torii (drawing above) is the symbol of Shinto. It stands at the entrance of a Shinto shrine. The crossbars symbolize the earth and the posts represent pillars that support the sky. Statues which represented the souls of ancestors' Shinto worship are referred to as ottoke. (In Madame Butterfly, Pinkerton ignorantly calls them pupazzi - little puppets.) A Shinto priest is known as a Bonze. Jigai is the Japanese word for female ritual suicide performed by cutting the jugular vein with a sword. The male version of ritual suicide is known as seppuku (hara kiri) and is performed by cutting one's abdomen with a short sword. This extremely painful practice, which dates back to the ninth century, was the only way for a high-ranking Japanese of the military class to avoid facing disgrace and to remove a blot on his honor. Westerners frequently refer to this practice as hari kari; a slang term used incorrectly. CIO-CIO-San performs the ritual of jigai in Madame Butterfly. Mikado was the ancient title of the Emperor of Japan. The word mikado actually comes from the Japanese word that means exalted gate. This demonstrates the reverence that the Japanese people held for their ruler. Japan's ruling dynasty is considered by many historians to be the oldest in the world, with the reign of Jimmu, the first mikado, dating back to 660 B.C. (see Shinto). In the A.D. 500's, after Chinese civilization came to Japan, the Japanese began to call their Emperor Tenno, which means heavenly emperor. The emperor is never referred to by his personal name. Gilbert and Sullivan wrote an operetta set in Japan and called it "The Mikado." Shosi are sliding screen panels made of translucent rice paper mounted on a delicate wooden frame. They are used in Japanese homes as partitions, doors, and even as walls.